2014 vintage was slightly warmer than average at Parawa without heat waves and with above average rainfall in the winter to replenish soil moisture and continuing through the growing season. Foggy Hill received 1208°C days of heat over the 2014 growing season against the long-term average of 1135°C days. The spring months were very warm and this combined with the moist soils accelerated the growth and fruiting processes at Parawa ensuring an early harvest. As elsewhere in southeast Australia the moist warm growing conditions conspired against the flowering and fruit setting processes and the crop was very small at 2.2 tonnes/hectare. The cool and moderate summer day temperatures of the very maritime Parawa climate preserved the fragile and delicate aromatic Pinot Noir varietal character. The small black bunches of Foggy Hill Pinot Noir were hand harvested on the 7tth and 8th of March, 1 week before the normal harvest date. They were transported to the Tapanappa winery in the Piccadilly Valley where the grapes were de-stemmed, crushed and chilled to 0.8 tonne open fermentation tubs without the addition of whole bunches. A four-day cold maceration preceded the initiation of fermentation. Fermentation took 8 days of daily hand plunging and reached a peak of 32°C. At the completion of fermentation the tubs were sealed down for a further 8 days of maceration on the skins. After 10 months in barrique, Tapanappa Foggy Hill Pinot Noir was clear racked and bottled in February 2015. 2014 Tapanappa Foggy Hill Pinot Noir is the product of a slightly warmer than average vintage from the very cool Foggy Hill Parawa site. 2014 vintage was defined by the poor fruit set and low yields in an otherwise perfect growing season for Pinot Noir. The colour is dense by Pinot Noir standards reflecting the sunny vintage effect on berry pigmentation and the effect of plucking the leaves from around bunches before veraison. The fruit aroma is of spicy, sappy, ripe cherries with the floral notes that contribute to Pinot’s “peacock’s tail”. 2014 has contributed one of the most aromatic Foggy Hill Pinot Noirs yet. The palate similarly has intense fruit flavours that persist reflecting the aromas but with very definite tannin structure that provides a savoury finish. 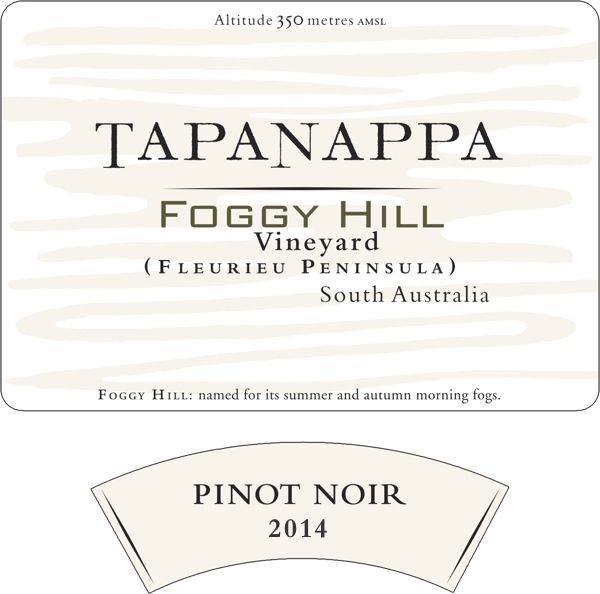 2014 Tapanappa Foggy Hill Pinot Noir is “a pure expression of the unique Parawa, Fleurieu Peninsula terroir”. Bottled in February 2015. Only 308 dozen grown and made.